The view from my anchorage – don’t mind the mess of the mainsail. We had a slow start to the day. Susanna didn’t get home from work last night until nearly midnight. I don’t sleep well until she is home. So, we didn’t get the early start that we had planned, but sometimes it is important to sleep in. I did some chores around the house in the morning, but by early afternoon I was ready to head back onto the water. This would be my first solo sail with the boat (and only the third time I’ve taken her out). The wind was good. I was able to make about 3.5 knots with just the main up, and a little over 5 at times with both sails up. However, it is much easier to solo with just the main. 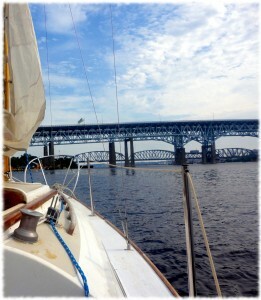 I also decided to anchor for a bit, just upriver from the bridges. It was a chance for a snack and to try out the anchor. The anchor held – and brought up with it a bunch of mud that I had to clean off back at the marina. Lesson’s learned: I need a bit more practice backing out of the marina. However, my landing was nearly perfect. At least better than the group of 4 guys that came sailing into the marina with both sails up. They didn’t take the sails down until way late, and bounced their boat off the dock. I couldn’t laugh too much – I wasn’t any more graceful departing. I’ll have to work on getting the jib down single-handed. I wound up dunking it into the river. At least I didn’t dunk myself into the river. The boat sails very well with just the main up – it is very well balanced. It is a long drive down the river from the submarine base marina. Especially when you have to tack your way upwind.